The Rockets prepare to take possession of a throw-in by the Patriots. 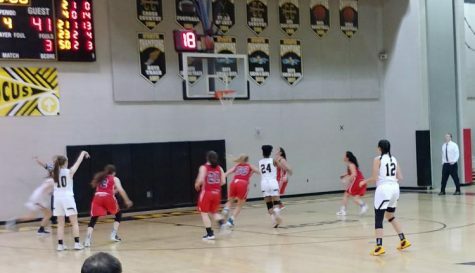 On Friday, Jan. 11, the Richard Montgomery girls basketball team defeated the Wootton Patriots, at home, improving their season record to 8-4. The Rockets were looking to secure yet another win, while the Wootton team was still searching for their first. The Rockets put pressure on the Patriots’ offense early in the first quarter with junior Taheerah Rashad coming down from half court to knock the ball out of the air to gain possession on a Patriots inbound play. Junior point guard Anujin Dashdorj ended up with the ball and made a pass up to freshman Talia Kouncar for a fast break, ending in a routine layup that put the Rockets up 4-0. By the second quarter, the Rockets had fallen behind, trailing the Patriots 17-19, but they soon came back with a 17-2 run, starting with a three-pointer from small forward Kouncar. During this run, Kouncar and sophomore shooting guard Calie Dunn each had two three-pointers, with three out of the four coming from the corner, which the Patriots’ zone defense had left wide open. The girls maintained a strong defense and patient offense against an aggressive Wootton defense that helped them regain the lead at 34-21 heading into the half. The Rockets kept their offense moving in the second half with a fast break from Kouncar leading to a left handed layup. However, the Patriots gave them a run for their money, keeping the Rockets’ defense on their toes and maintaining a close point margin, but the three-pointers from Dashdorj and Dunn allowed the Rockets to pull ahead, gaining the strength and momentum that led them into the fourth quarter. The Rockets’ all-around effort let them come away with the 60-45 win in the end, with a key block from Kouncar and ten total steals compared to the Patriots’ eight. Also, three of the Rockets’ top scorers managed to avoid fouling out, allowing them to keep racking up the points to give the Rockets the edge. The Rockets’ top scorers in this game were Dashdorj with 22 points and one foul, Kouncar with 20 points and three fouls, and Dunn with 13 points and two fouls. Shooting guard Calie Dunn takes a three-point shot. Photo by Selma Hamza. The Rockets look to extend their winning streak to four games on Friday, Jan. 18 as they travel to Quince Orchard for a 7:15 p.m tip-off.